Authentically hand crafted, this artisan bread is now available for you to try. Not all bread is created equal, artisan techniques really do lead to more delicious bread which is actually easier to digest. This technique signifies that the bread is made with care, expertise and quality of ingredients. 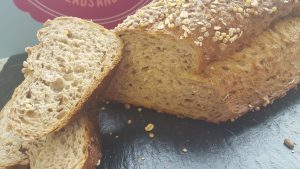 The Mighty Malted Sourdough bread is naturally healthy with an outstanding flavour and texture. Made with a blend of seeds and a hint of spices for a unique flavour experience. It contains Vitamin E, Magnesium and Calcium for extra nutritional goodness. We take our responsibility for manufacturing nutritious products, seriously. That’s why we want you to know that Vitamin E is the indispensable helper for strengthening body cells in the fight against environmental and stress related factors. Calcium and Magnesium play a significant roll in maintaining bones, teeth, muscles and the energy-yielding metabolism. Magnesium also gives the cells new strength. Natural supplements in a slice of bread. The Mighty Malted Sourdough bread is currently available to thaw and serve. Call Lucy, Julie or Ashley for more information or order them today on 01792 579908.